As promised, here are two more designers who showcased at Vancouver Fashion Week. I will have a couple more, but they going to be interspersed with other articles. Variety is the spice of life! 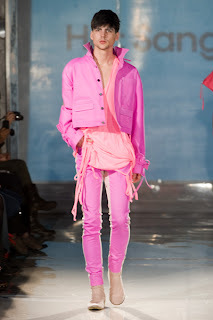 Today I want to talk about two Korean designers that presented collections on Wednesday - Ha Sang Beg and Doii Lee. I have to again say how exciting it is to be able to see what designers are doing around the world. It opens local eyes to different aesthetics (especially for men), but it also serves to show the level necessary to compete on a more global scale. Both of these designers brought excellent construction skills and creativity to their collections, but from there they diverged widely. When being interviewed by Frock of Ages, Ha Sang Beg said his collection was called, "Slipless Rapunzel and the Funky Bunch." It was never decided if this was fact or said in fun, but the overall impression one gets of this designer is that he definitely enjoys his fashion. VFW saw him sporting bright green glasses with a welcoming smile on his face at all times and his collection could be best described as vibrant - full of colour and energy. 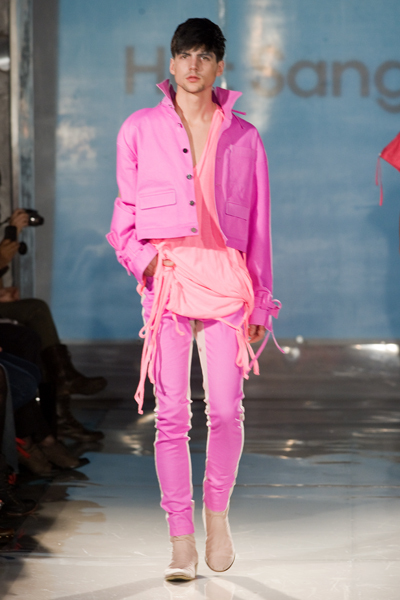 Fashion called at the early age of 18 and he has earned a BA in Korea and a Masters in England. While studying in England, he was taught to knit and crochet by his landlady - costumer Natasha Korniloff - which led him to personally create the unusual knitwear pieces in his collection. It's hard to know where to start with this designer as his point of view is so at odds with our laid back West Coast Canadian culture. It's a shock to the senses at first and then you adjust and begin to appreciate the details. There are really two parts to this collection that Ha Sang Beg has managed to blend together well. In talking with blogger Scarlet Black, he cited inspirations such as Freddie Mercury and Rapunzel. I think that probably is the best way to look at the two sides. The Freddie Mercury influence was showcased in the strong, structured woven pieces with vibrant colours and sparkle details. Zipper accents could be found through-out. I particularly liked the one included on the back yoke of the jackets. Although the colour palette stayed bold, Rapunzel's hair was evident in the soft strands of hand knit interwoven and draped on the torso. Strong colours dominated and shoes were ordered from a manufacturer in colours to complete the look. I enjoyed the pieces that were colour blocked in particular as it took the impact down just a notch (probably more sell-able in our Western market), but the overall effect of the runway show was a visual explosion. Ha Sang Beg's website can be found at www.hasangbeg.com. Talk about a jarring sensation. After the loud rock show that was Ha Sang Beg, we were introduced to the soft Parisian spring by Doii Lee. The press this designer has received includes Vogue.com where they state, "You may not have heard (or be able to pronounce), the name Doii Lee, but commit it to your fashion memory anyway because her pedigree says it is a name you will hear again..." I agree! She has a unique point of view that allows women to return to a look that is feminine and soft. Custom prints, hand embroidered fabrics, playful linings, delicate silk and lace and sequins - from the opening lace dress to the final gown, it was very Parisian in feel. One can only describe this collection as both beautiful and etheral. In an interview with blogger Scarlet Black she talks about her inspiration, "The story for S/S 2011 '...focuses on the theme of divine unification. The main character is a pagan flower girl who travels around the world visiting local deities. Through her travels and experiences she comes to an understanding of universal beauty, which is free from cultural barriers and prejudice. '” Everything was beautifully contructed and extremely feminine. I loved the way she played with the sequins. They would be on the body of the garment, but not on the sleeves or she might reverse that and put them on sleeves but not the body. Soft pastels were the theme and bows were perfectly tied. The prints were also exquisite, each created by Doii. Who would wear this collection? "Doii Paris is for women who want to look stunning - an original line for those who seek beautiful, novel designs that glisten with daring, independence and glamour." The Dorii Paris website can be found at www.doiiparis.com.